The sector still suffers from fierce competition with prices and profitability at a low level, while major players keep putting pressure on subcontractors. 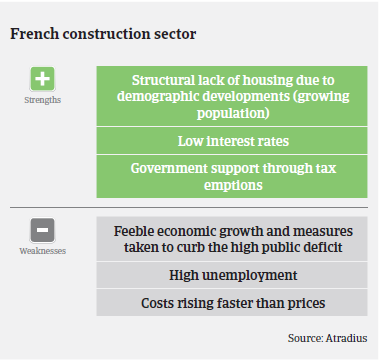 The rebound of the French construction sector observed in 2016 accelerated last year as, according to the French Builders Association FFB (Fédération Française du Bâtiment), in 2017 French construction activity grew 4.7% in volume, after a 1.9% rise in 2016. Growth was driven by new residential construction activity: in September 2017 new housing starts amounted to 414,000 units over the previous 12 months, compared to 380,000 in December 2016. This surge was mainly spurred by tax exemptions aimed at fostering real estate investment and supporting first-time buyers. In 2018 construction activity growth is forecast to slow down to 2.4%, as the effect of tax exemptions will expire. At the same time rising real estate prices will affect household purchasing power, despite low interest rates. Renovation activity is expected to remain stable while public construction activity will remain low due to public budget spending constraints. 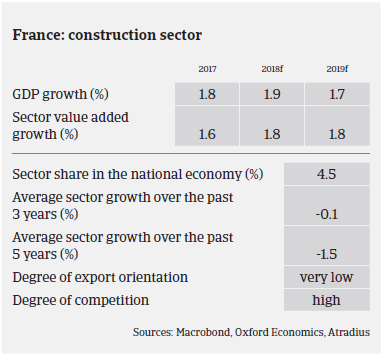 That said, French construction contractors are currently more optimistic than in the past as revenues are growing, employment is picking up, backlogs are recovering and the production capacity utilization rate remains over its long-term average. Despite the ongoing recovery, construction still suffers from fierce competition, with prices and profitability remaining at a low level. Margins of many businesses have not yet benefited from the recovery, while major players keep putting pressure on their subcontractors. Despite the current upturn, banks still remain very selective with their loans to construction businesses, making access to short-term credit difficult. Due to the ongoing difficulties in accessing short-term credit facilities - in a recovery period where buyers have to finance their growth - cash management remains a major issue for many, mainly smaller, construction businesses. After a decrease in 2016 non-payment notifications only levelled off in 2017, therefore remaining at a high level, and no substantial decrease is expected in 2018. At least construction insolvencies continued to decrease in 2017 (down 12% year-on-year in the period of January-September 2017). This positive trend is expected to continue in 2018, with business failures expected to decline by about 7%. However, compared to other industries the share of construction insolvencies and protracted payments is expected to remain high. Despite the current recovery we remain cautious in our underwriting stance, but we continue to provide cover to our customers whenever it is reasonable and prudent to do so. We closely monitor and review buyers to anticipate potential risks to our customers. We continue to scrutinise the public construction subsector due to weak demand and very high regional disparities. Despite a modest recovery in 2017 and a stable performance outlook in 2018 we continue to pay attention to the furnishing segment (insulation, plastering, joinery installation, plumbing, roof covering). We also closely monitor the construction materials wholesaler business, which suffered in 2017 as customers took advantage of fierce competition in this segment by putting pressure on sales prices. We focus on the cash situation and loan facilities available to buyers, especially smaller and mid-sized companies. 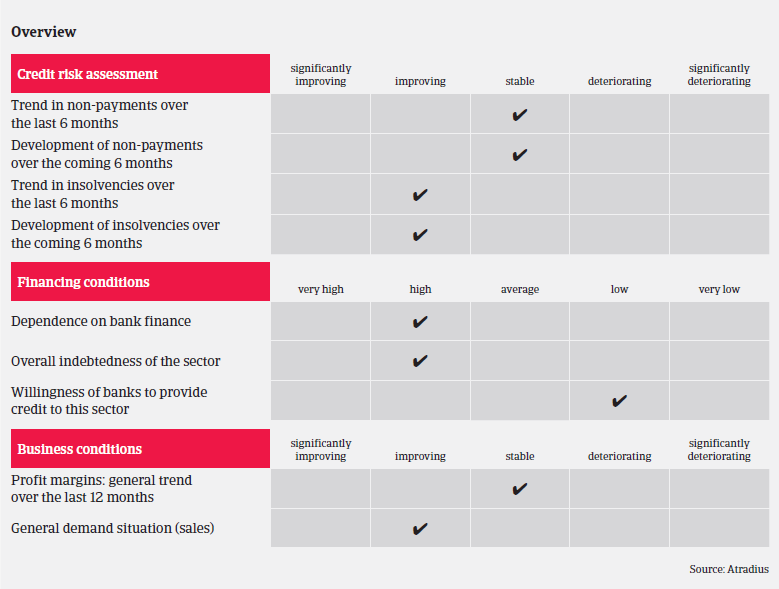 Several key financial indicators must be analysed: the level of activity, margins and ability to fund working capital requirements. High financial costs are a key indicator of potential pressure on cash. We also try to assess the ability of construction businesses to manage bigger projects than usual, as we often notice that smaller enterprises cannot cope with financial distress due to insufficient pricing and allocation of resources.